Magna Flow Exhaust -- my experience. What's your experience? 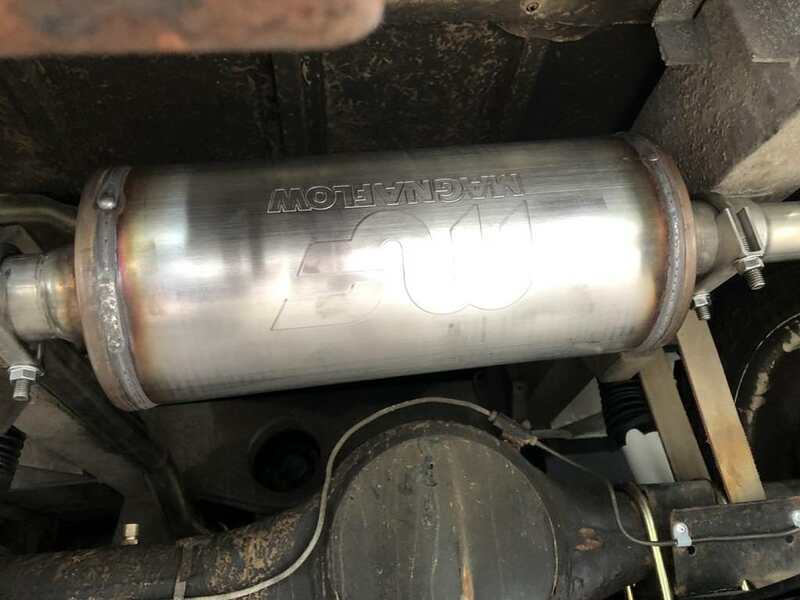 Thread: Magna Flow Exhaust -- my experience. What's your experience? I spent the day putting Magna Flow exhaust from Rovers North on my 64 IIA 88. It's a high quality unit with top notch construction and materials, but I had two fitting issues I thought I'd share. It should be noted that even though my Land Rover is a "1964" it's a true Bitsa Rover that I built using the chassis of an early Series 3 ('72, '74, I'm not sure anymore) parts car. First, the bracket that is welded onto the intermediate pipe is about 1" off. No matter what I did, it simply did not line up with the bracket on the chassis of the car that is supposed to match up with it. Really the only play in the system here is the degree to which the intermediate pipe and down pipe are inserted/mated into each other. I would've needed the intermediate pipe to insert/mate an additional inch into the down pipe to get the welded flange on the intermediate pipe to line up with the bracket on the chassis. I ended up kludging it with a homemade bracket made from 1" bar stock to get the system suspended at that point. 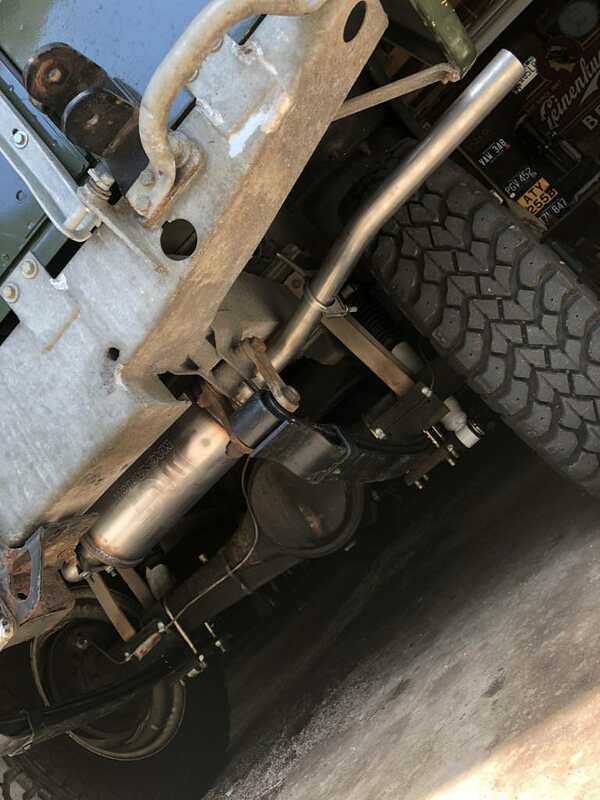 Second, the instructions clearly show the two-piece muffler mount rubber buffer custom hanger thingamajig hanging from a chassis bracket that's welded on the inside of the chassis leg. Well, my mount is on the outside (ie, wheel side) of the chassis leg. 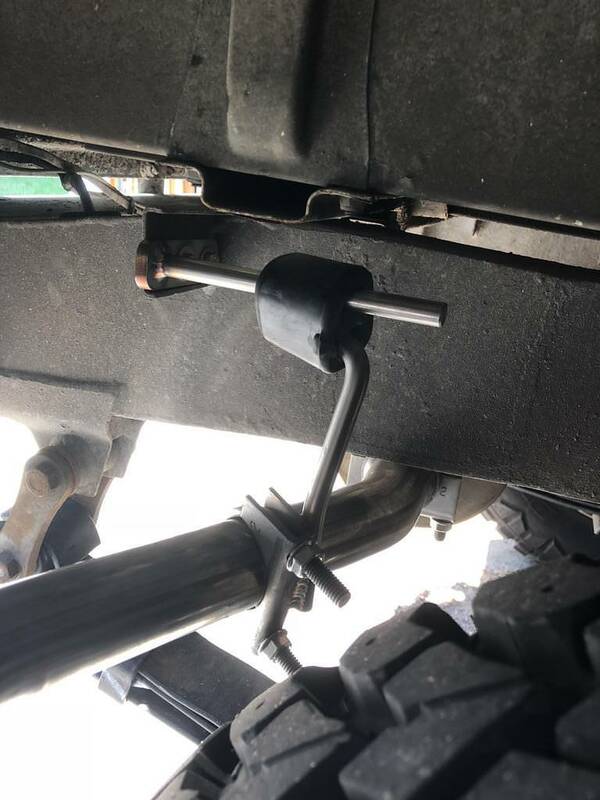 It still works, but this mount is also the exhaust clamp that seals the muffler to the tail pipe, so it meant that I had to go to my local auto parts store and buy another 2" exhaust clamp. No biggie, but it's kind of irritating that this variation in chassis isn't accommodated by the Magna Flow system offered by Rovers North. 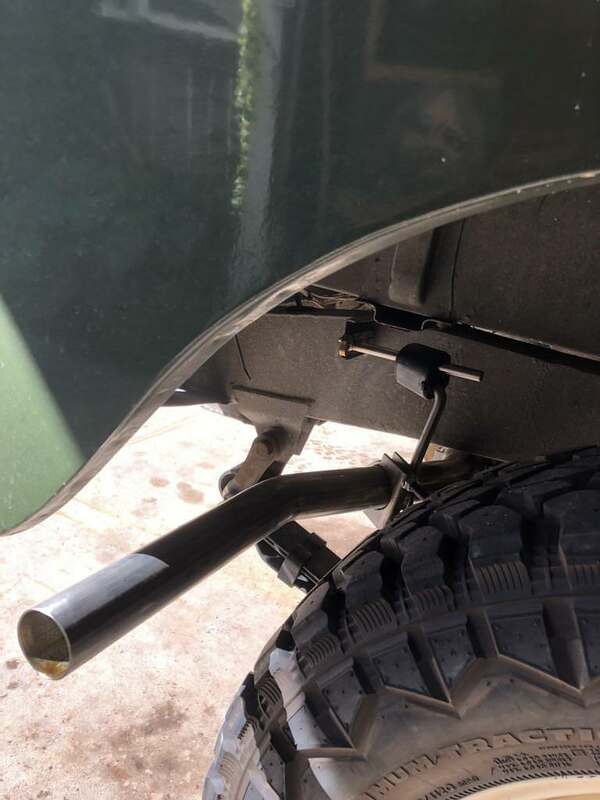 I also have a question for anyone who is using this exhaust. Someone at Rovers North had taken a Sharpie and marked the muffler itself with the direction of flow. So that's how I mounted the muffler, but it means that the words "Magna Flow" embossed on the muffler are upside down. I would've just guessed that Magna Flow would've made this unit so their name and logo is readable when the thing is mounted correctly. Finally, the Magna Flow exhaust system has a pup-pup-pup-pup puttery sound, like some punk kid's tuner car! My own 17-yr old son has a Ford Focus ST that he auto-crosses, and he loved the way it sounded, if that tells you anything. I walked around and listened at every joint and it's definitely not leaking anywhere. The puttery sound is definitely the exhaust note coming out the tailpipe. It kinda makes me wonder if I just don't have realistic expectations for what this system should sound like (or maybe the muffler is mounted backwards - LOL). Anyway, I was wondering if anybody else could corroborate this? First, here's the kludged bracket I came up with to account for the misplaced intermediate pipe bracket. Note the rubber buffer is not connected to the pipe bracket. I'll take it to an exhaust shop and see if they can weld up an extension to the pipe bracket so that I can use the rubber buffer correctly. 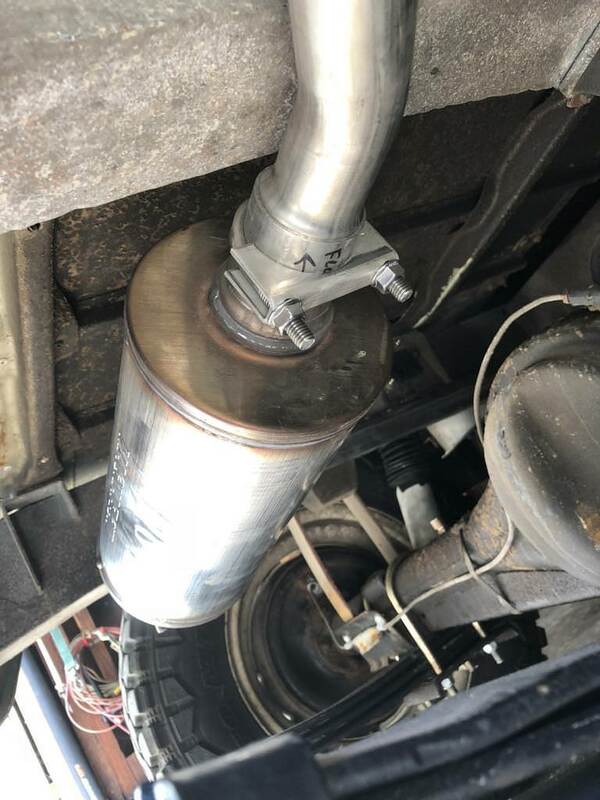 The welded bracket on the intermediate pipe would've needed to be located about 1" closer to the engine end of the car to fit properly. Second, a view of the muffler itself. Note the "Flow --->" notation written in sharpie on the exit end of the muffler. Also, the Magna Flow logo is upside down. 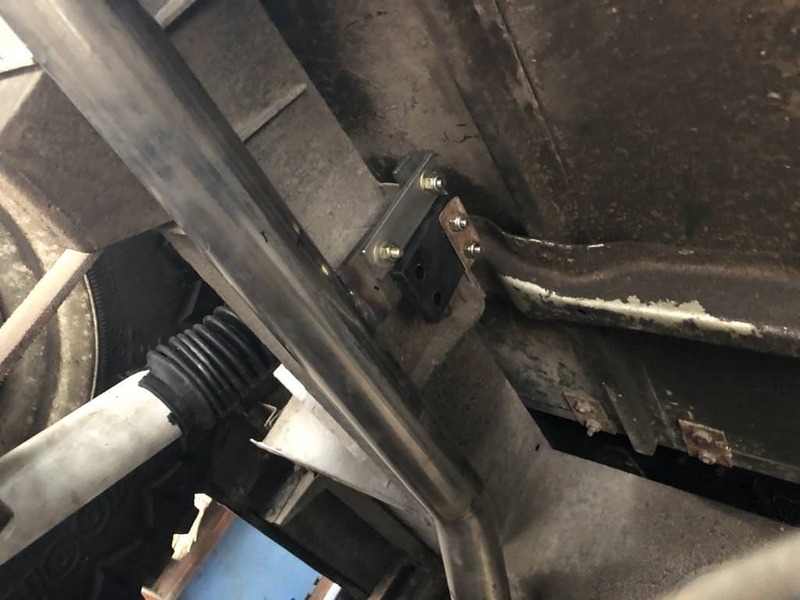 This picture shows the muffler and the inside surface of the chassis leg that *should have* an exhaust mounting bracket welded to it, but doesn't. Because of this I had to use two clamps on either end of the muffler, and use the rubber buffer custom hanger thingamajig that comes with the kit on the outside of the chassis leg.